!! !NOTICE: Since I'm deleting my PhotoBucket account, I will try to restore as many pictures as possible, but it may take some time!!! 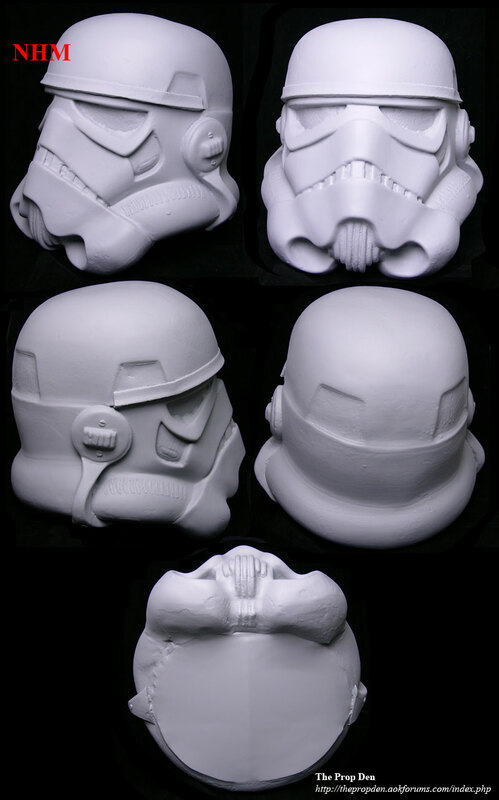 There are few projects that excite me as much as this one and I’m not really a trooper guy, though I do like the helmet a great deal and find it to be a wonderful piece of art, giving the Empire a cold and heartless skull appearance to their deadly stormtroopers. Everyone can remember the first scene in Star Wars when they blast through the door and pour out blasting everything and everybody – the only real time in the whole Star Wars saga where the troopers were actually deadly and frighteningly efficient and was able to take over a star ship rather quickly. 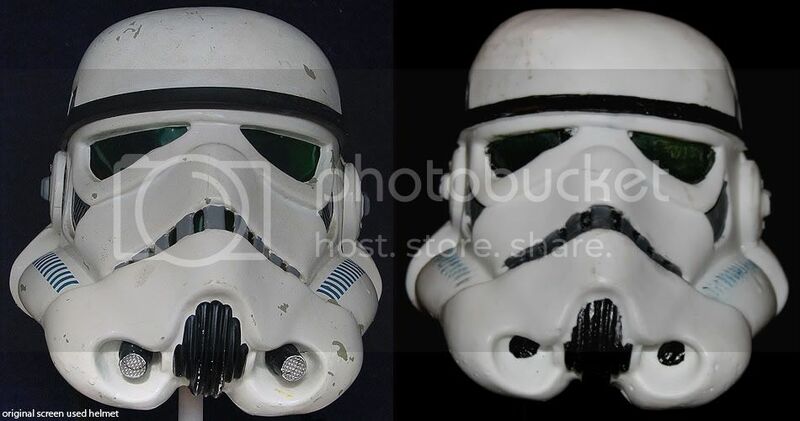 I’ve dreamt for a long time to own a trooper helmet – hell, when I was little I dreamt that I could go to the local toy store and buy my very own set of armor and that it would look exactly like the screen used. I’ve owned a few different helmets over the years, all great, but they were sold to help fund this project – sadly, one got lost/stolen in transit, so that money got nixed, but I managed. That was first test printed in smaller scale to see what level of detail could be retained in the print, which was shown off to the various people approached for interest, but recently the full sized print was done and here it is in all its glory. Unlike anything done previously with this level of detail richness that wasn’t possible before recently. Without futher ado, I here present the master print that will generate a small run among the investors. What comes after that is undecided – I will leave that up to the guy in charge. Last edited by No Humor Man on Tue Mar 29, 2011 9:12 pm, edited 3 times in total. 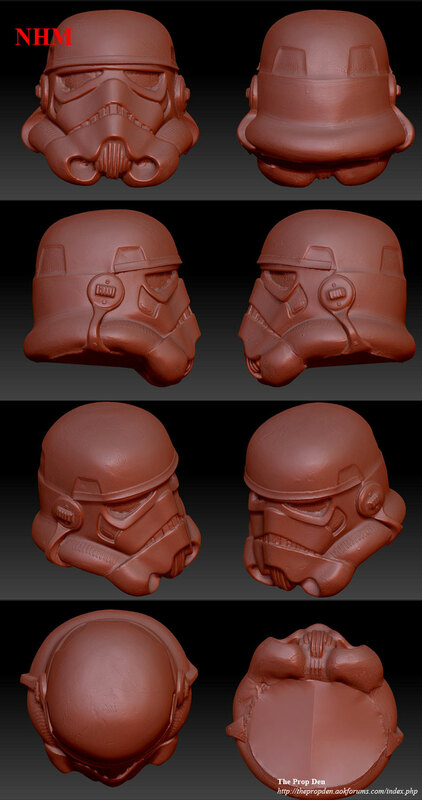 Very interesting... What specific helmet was this from, and is the current Ebay resin casting being offered a "child" of this project? Now that really is something special.Nice work!!! The eBay helmet is made by the recaster fan_made, who is also recasting JRX and cyberman's excellent sculpt. A leech on the community and has nothing to do with this project. This is from the scan of the Dave M *Set for Stun* helmet, which also was the basis for the foam carved TE fiberglass and later HDPE helmets. The main difference between carving something like this and printing it is that with carving, you get the shape, but none of the surface paint details or drips or even the imprints of the painted decal areas. 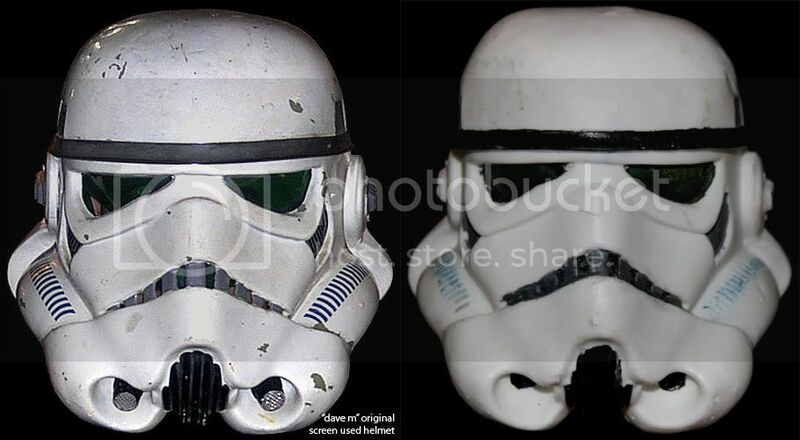 With a print, you get all that and depending on the resolution it was printed in, the higher you go the better, you can make a near identical clone of the original helmet or rather as good as the scan was of that helmet - which most of us know is a pretty good scan. The main problem with the TE fiberglass SFS helmet is that all the details have been removed. Here, we can see the marks of the HDPE, paint, etc... Very beautiful helmet which looks very authentic! 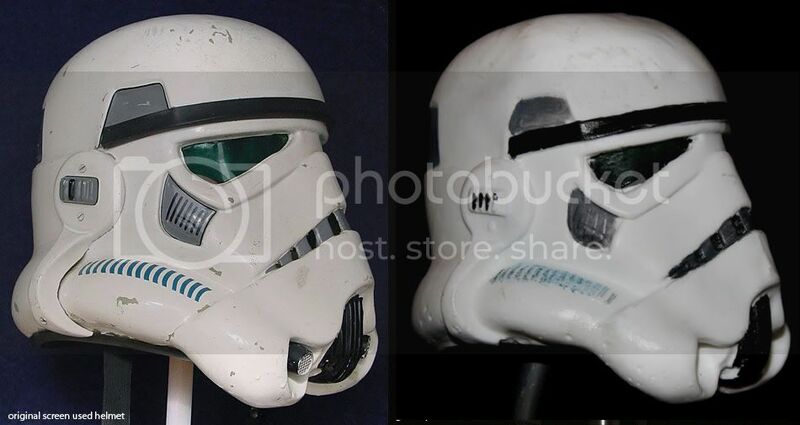 I can't wait to get this in hand to check it out, but from what I've seen it is a near perfect clone of the real helmet. More pictures will be posted at that time and then it'll be a joy to paint this baby up right along with my RotJ helmet. I'm not really into troopers, but this is big news. Considering the level of detail the scan picked up, it is very impressive. You could actually follow the scan outline and chip the paint off and have an exact duplicate of the original. All the bumps and paint drips are there in the scan. It really is a beauty. I was given a souvenir of the test print. This is a near 1/2 scale resin version. Even at this scale the level of detail is evident. The tube stripes can be felt, that's how detailed this scan is. This is a quick and dirty version, which was pulled to see what the scan could produce. It's a little wonkie and has small air bubbles and not nearly as perfect as what will later be printed off the scan. It was a quick test pull, but I was given the thumbs up to show it off to you guys. I can only say that this version will be unlike anything that is currently out there. The angles aren't perfect, but you get the picture. As an outside obsever, even with all the scaling, bumpy, holey, quick & dirty issues you can So see this is going to be the true meaning of prop forgery. are one of you guy's called lovejoy by any chance. Wow, what an awesome project, I love that master print Carsten, and the detail pick up in your 1/2 scale version's incredible Pete! The half scale version is rather interesting looking. Though it is a dud, I think that if it had been painted better the similarity in the finer details to the original would have been more evident - the overall shape and detailing is spot on, even in that scale. That much is evident. Thanks. I'm just the messenger, so cannot take credit for getting this done. All will be revealed in due time. Here are a few more pictures for everybody's enjoyment. This really is spectacular.